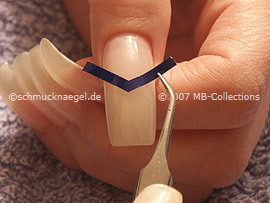 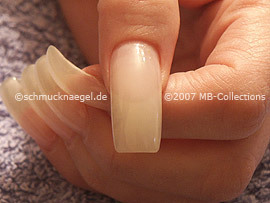 Take up with the tweezers a V-shaped French manicure template and stick it on your fingernail. 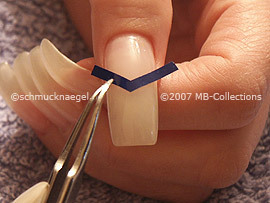 Now press with the tweezers the V-shaped French manicure template firmly on your fingernail. 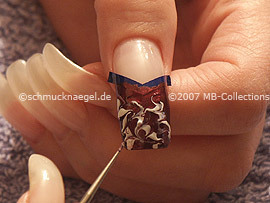 The result should correspond approximately to the picture. 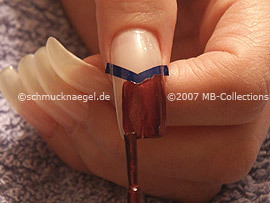 Paint the front part of the fingernail below the V-shaped French manicure template with the nail polish in the colour copper. 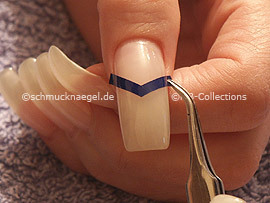 Use the nail art pen in the colour white. 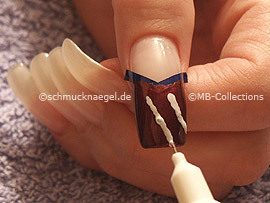 Now draw three lines on the damp nail polish. 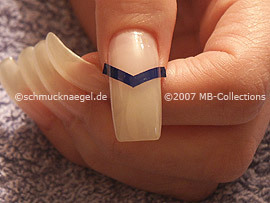 Set the spot-swirl or toothpick at the upper point of the right line and pull a straight line or a curve to the side. 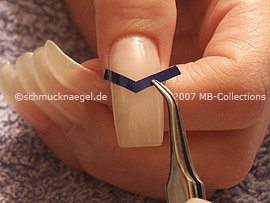 Now set the spot-swirl or toothpick somewhat below the first line or first curve and pull a straight line or a curve to the side. 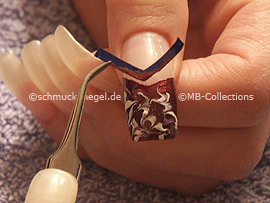 Now repeat the procedure for the middle line. 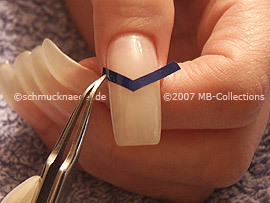 Now repeat the procedure for the left line. 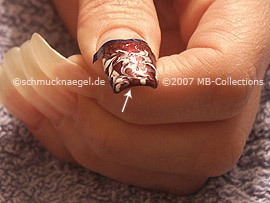 The copper french motif should correspond approximately to the picture. 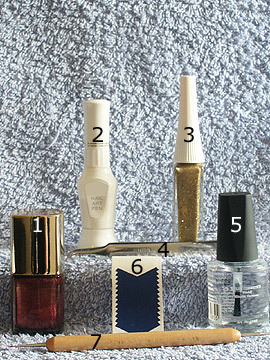 Now use the nail art liner in the colour gold-glitter. 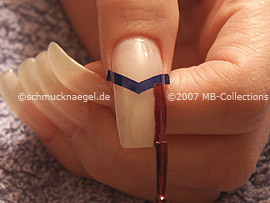 Draw a line at the transition of the nail polish and the free nail surface. The nail art copper french motif should correspond approximately to the picture. 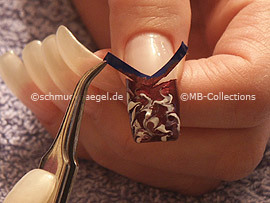 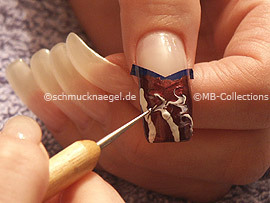 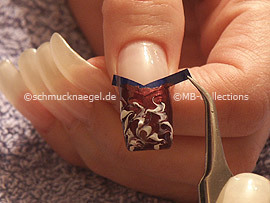 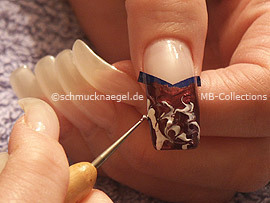 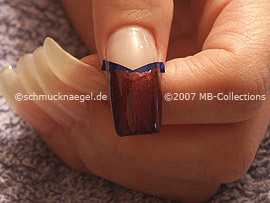 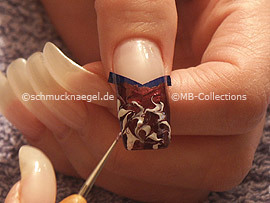 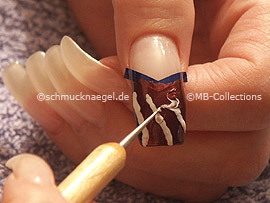 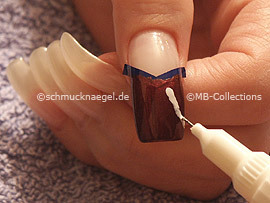 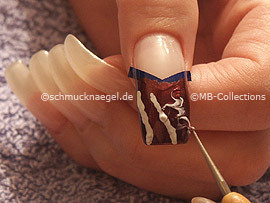 Before you continue with the last step, wait until the nail polish on the fingernail is dried. 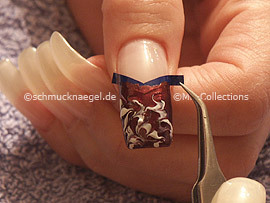 After the clear nail polish is dried, the nail art copper french motif is finished. 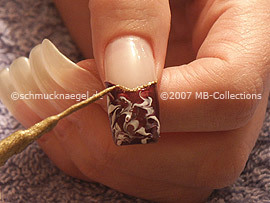 Copper french motif was last modified: June 8th, 2016 by Make it Smart e.K. 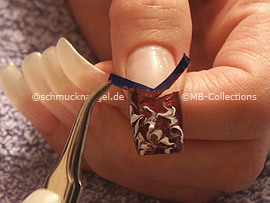 French manicure templates, Nail art liner, Nail art pen, Nail polish, Spot-Swirl.